Thanks to several people who have asked about walkingtokaido and my progress. Many have traveled the path before me, and all of your prods and tips are welcome. I have not really vanished, nor has my resolve to walk the old sea road vanished either. I have been sidetracked by lots of things (isn’t that just the way life works?). 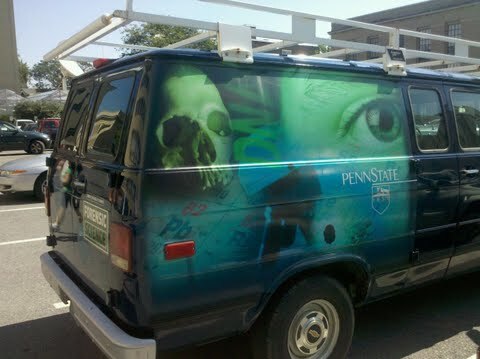 I’ve put up a couple of other blogs about trips across country (relocating my kids to different universities. My favorite is http://2002civic2universities2012.wordpress.com/ . More recently my daughter and I drove up to her next University–U.C. Davis–to get her acclimated before she starts grad school. She would like to travel with me on the Old Tokaido, and she would make an amazing companion. We (rarely) right on trips, and she actually speaks some Japanese and has been to Japan before. 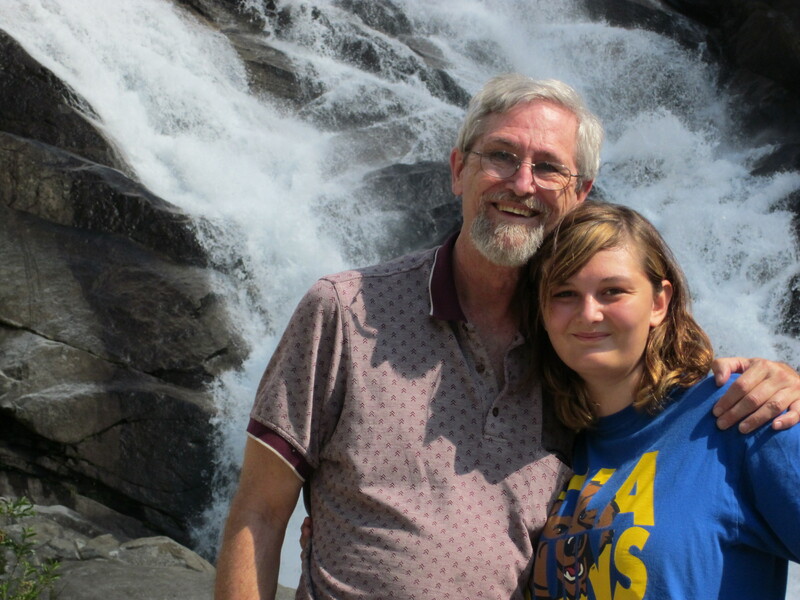 Work (gotta pay for things), jury duty, plumbing–life stuff–has kept me busy, and it may be that I won’t get on the road until Michelle is through with her studies. I will be that Sgt. Pepper’s song age by then, but I’m still walking (the Santa Monica beach is my usual trail; it faces Old Tokaido…thousands of miles across the Pacific). There are still those serendipitous “things” that keep me energized. 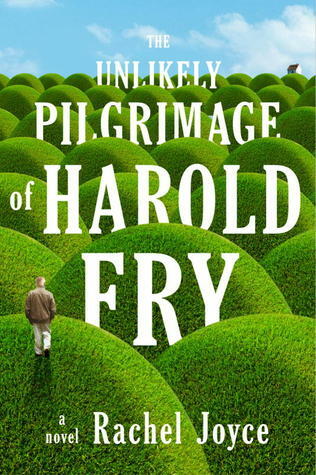 The latest is a novel by Rachel Joyce called The Unlikely Pilgrimage of Harold Fry. Without giving too much away, Harold Fry, retired and in a dead marriage, receives a letter from a woman, Queenie, who had been his co-worker in a brewery decades earlier. She is dying of cancer, and she is just letting old acquaintances know, not expecting anything from the old acquaintances. Harold writes a wholly-inadequate reply, the briefest note, to Queenie, and he sets off to the corner postal box to mail it. Somehow he can’t bring himself to just drop it in the box, and he determines to walk to the next box, then the post office, and so on. Walking outside Kingsbridge, in the south of England, he just knows he has to walk to see Queenie in her hospice in Berwick-upon-Tweed, in the north of England. Thus, a pilgrimage to save Queenie begins. A reproduction of Hiroshige’s prints and Patrick Carey’s book hooked me on walking in the first place. Rachel Joyce’s fiction, Alan Booth’s non-fiction, and other works keep it alive. but before we get to Part 2, The children’s novel about Hokusai’s life has the aged master predicting that some day his young apprentice, Tojiro, might take up a walking stick and see the world beyond Edo. He suggests the lovely walk along the Tokaido to Kyoto. 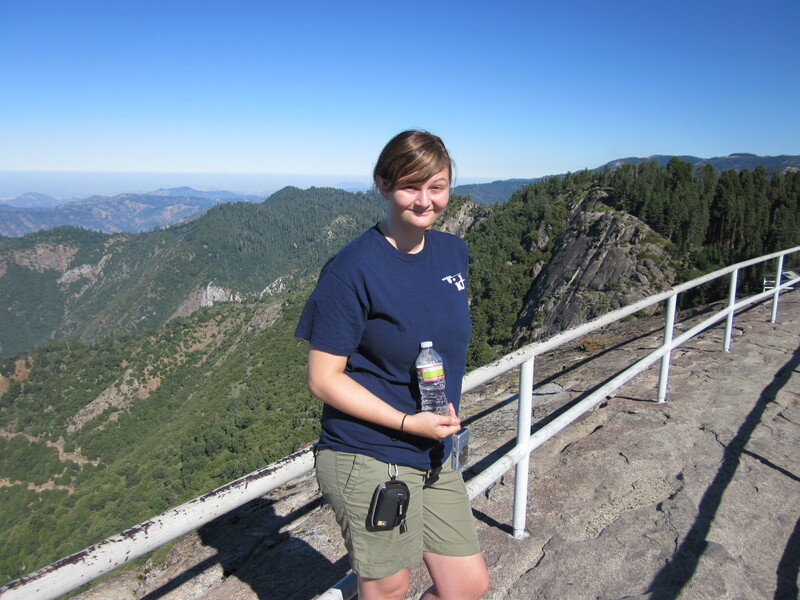 One of the things Michelle most wanted to do before going off to college was to re-visit Sequoia. We took the kids twice; both times they were very little, and the second time was the first time they’d actually been in enough snow to make snowmen. We’d been cabin camping around Grant Grove then, but most of my memories of Sequoia were tent camping in Lodgepole (quite primitive when I first went to Sequoia many years ago, revamped a decade or two ago so that there is now a nature center, small store, even laundry facilities by the campground entrance. It’s a big campground that straddles the north fork of the Kaweah River. Yes, there are some flush toilets, and an impregnable steel bear-proof box is in each campsite. Here’s the problem: Sequoia fills up 4-8 months in advance every year, and Michelle mentioned this with a little over a month to go before we bundled her off to Pennsylvania. Still, nothing ventured. I kept at the online registration site, and someone must have eventually canceled because two nights at just one tent site opened up, and I grabbed it. We loved the peace, the change from Los Angeles (Santa Monica). The weather was clear and warm (tending to hot), the air so rich with evergreen that, matched with the thin air over 6,000 feet, it prompted the rangers to post an air warning (not from smog but from possible allergies). The river (main visual entertainment along with the flickering fire at night) rushed blue and green, and Michelle was a bit miffed I told her I wasn’t bringing a swim suit. 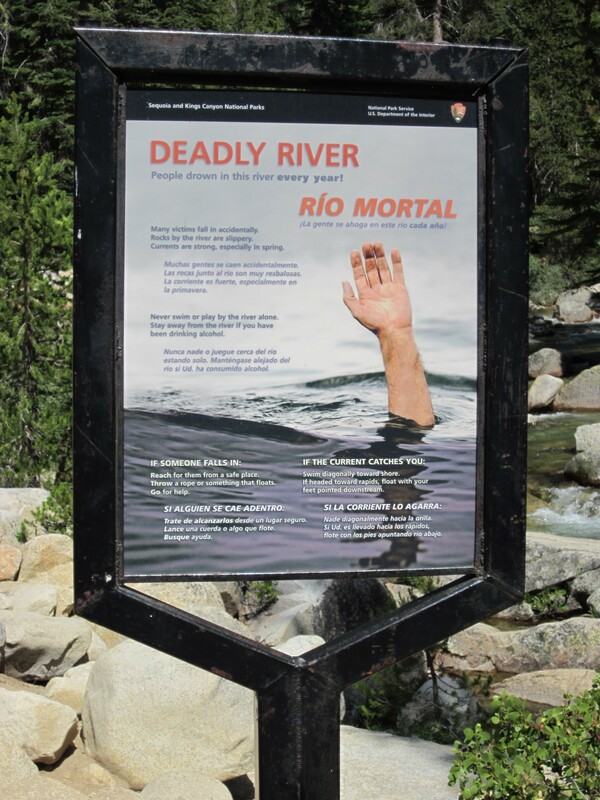 Now my reasoning was this: last time I’d been to Sequoia, signs about river deaths were posted at the trail head. This time new signs shouted, “Deadly River – Rio Mortal” (with the last wave from the hand of a drowning person sinking beneath the water). Then we saw groups of kids swimming in the clear pools. It really did look inviting. I offered to give Michelle my spare shorts to swim in, but we both settled on dangling our legs in the water. COLD DOES NOT DESCRIBE IT. And we saw the reason when we hiked up the trail to Tokopah Falls. There are still patches of snow and ice in the shadowy parts of the mountains; the river is ice-fed. With ice-numb feet we decided that maybe it wasn’t such a bad thing we didn’t bring out suits. Sequoia has changed a lot. In an attempt to lower the footprint of so many thousands of tourists they now have shuttles from one meadow to the next, and that’s a good thing (unless 44 Chinese hikers are piled into an already-full shuttle that says, “Maximum Occupancy 25). But day one we took the shuttle to the General Sherman tree, walked through the pudgy, orange giants and came back to the campsite for a bite. Then the trek up to Tokopah Falls (leisurely as long as you are in shape, used to the thin air, expecting the switchback scree near the end) tested our city legs. We actually saw a mother bear and her two cubs on the trail (they didn’t seem to bother with the hikers who snapped a gazillion photos), a pretty rare sight. And we did make it to the falls where we took pictures of parties who took pictures of us and so on. The trail head is deceptive, though. It’s so gentle (100 feet of blacktop leading to duff and then a variety of trail types), that this hike attracts kids, aging great-grandparents, mai-tai-toting couples in flowered shirts and muumuus, and people decked out in K2-ready backpack gear. On the way back down the trail, a few groups asked, “Are we almost there?” Michelle and I would try to assess the general condition of the group, and we’d give a heartening, “You’re almost there” or “You have an easy walk for about a quarter mile followed by some switchbacks over some loose rocks for the final quarter mile.” One couple with their kids had walked about 2/3 of the way in flip-flops, and they were tired. They asked us how much farther it was to the falls, and we told them. They looked crestfallen; they’d come so far but were just too footsore and unprepared to go the final bit. “But you can actually see the falls if you go about 100 yards around that bend there.” We actually walked them to the lower view of the falls, and they were happy they’d not hiked so far just to miss seeing the base of the falls. The next day (our last full day; it was a quick trip) saw us indecisive. There was a lot of roadwork going on in the park, and we’d wanted to go up Moro Rock, but that road was closed. That also kept us from another hike we’d planned-Crescent Meadow. We sort of ambled to Giant Forest area, and Michelle noticed the “Road Closed” sign was gone. So we drove past the Auto Log (you can no longer actually park on top of it for photos) to Moro Rock. this was one of those “I’m pretty sure I’m not in any shape to make this climb” moments. There are over 400 steps carved into the rock surface that allow tourist to toil up to the top where there is a spectacular view (more spectacular if the smog/fog doesn’t obscure the San Joaquin Valley in the distance) of the mountains ringing Sequoia. We were the second people on the rock (the first was a tourist who’d side-stepped the sign (which was there when he started) and hiked three miles in (impressive since he had about forty pounds of camera equipment strapped to him). And we had no problems; we just chugged up the steps and inclines and turnings and were there! Yes, we each went through a bottle of water on the way up, but water’s good stuff, no? And we took pictures of Castle Rock and the valley below us before we headed back down (the first shuttle was just arriving when we were about 1/2 way down. Our last Sequoia hike was a sedate ramble around Crescent Meadow. Well, sort of. We were going to do the 1 1/2 mile loop to look at what John Muir called, “The Gem of the Sequoias” and end up at Tharp’s Log (a hollowed-out, fallen log with rough-hewn table and fireplace and bed that was used by a rancher when he brought his cattle up to the meadow from the valleys below in the late 1800’s). Uncharacteristically, I did not look at the trail maps. I was sure I remembered the route. Well, I didn’t. We ended up taking a side path that had us dragging around muddy, mosquito-clouded Log Meadow. Tharp’s Log is not actually on Log Meadow; though there are plenty of other logs on this path which had not been hiked in some time (if the overgrowth covering the trail were any indicator). Hiking while batting away mosquitoes is not my favorite activity, and I was tired and grumpy when we reconnected with the trail to Tharp’s Log. Still, we made it (yes, with some mosquito bites), saw the rustic log-home, hiked the simple trail back to the parking lot. It was a wonderful trip. It showed me I need to walk more, and it reminded me just how much fun I have traveling with my daughter. Busy, hectic times. I’ve nearly finished George Meegan’s book; I’m learning teensy bits of Japanese (trying not to cross my eyes when I hear the variations which MAY occur and reminding myself that English is hardly a stranger to this; my daughter was pointing out words which sound alike but which have very different meanings which must be determined from context, and I thought about homophones in English (which and witch, there and they’re and their–that sort of thing; she says that in hiragana they will be spelled the same, but the differences are plain in kanji). I really think I need to buckle down and learn AT LEAST hiragana or katakana so that I can sound things out. I’ve also discovered that so many American-adopted words can be figured out with a bit of effort: boo-rou-soo for blouse, for example. I’m trying to get back to my t’ai chi practice to add to walking, and I’m now seriously looking at “stuff” at REI and other shops. We’ll have lots of nifty hikes there. I’ll post…REALLY…I WILL! OK, it’s been awhile since I’ve posted here. I plead…well…busy-ness. Michelle and I have been shopping and making up the itinerary for her soon-move to Pennsylvania. My neighbor whose husband works for Google has added me to the Google+ beta, and I’m seeing if that will be a good way to talk to my daughter when she’s away at college. I’m trying to get a jump on my new Film & Lit class (I’m only on lecture 3, but I have the framework of the class all set up). And I’m been reading George Meegan’s book The Longest Walk in bits; he’s reached Central America at this point. Aside from feeling that I’d really not enjoy the hardship that even a yoshikart could not make up for, I’m struck by how the walking diary is really a love story. And putting this together with Kintaro Walks Japan (Kintaro is in love with Ayumi, George and Yoshiko Meegan’s daughter), the whole thing washes over me with joy and relationship. It’s a very busy time, but I’ve not vanished. It’s Father’s Day, and what a lovely gift appeared on the dining room table this morning. There were also balloons that Jamahl (one of our cats) had managed to untie from the back of a chair, and I’d gotten a much-needed early gift of BBQ utensils last night. But the gift this morning was completely unexpected: Living Language Japanese (book, CDs, dictionary) and a pocket travel dictionary. Now my feet are really to the fire; I was dawdling with the basic text and workbook Michelle brought home from her Japanese class(es), and my excuse (which was a real one) was that the CDs were missing, so it was hard for me to practice in the car, while playing World of Warcraft, walking along the beach, just noodling around the office. This set comes with four CDs to help me practice some words, phrases, sentences, dialogues. I love that it says Complete in the title. I’m pretty sure four CD’s won’t have me mastering the entire language. But I’m also pretty sure that it will give me the rudiments I need to ask directions to the nearest bathroom or hotel or restaurant or telephone or bank. And I can, quite possibly, stuff four CDs worth of information into my greying skull. I’d better memorize the difference… this sort of thing could get me into trouble!